Below are user reviews of Shanghai: Great Moments and on the right are links to professionally written reviews. The summary of review scores shows the distribution of scores given by the professional reviewers for Shanghai: Great Moments. Column height indicates the number of reviews with a score within the range shown at the bottom of the column. Higher scores (columns further towards the right) are better. I recently got a new computer with Windows XP and the game insists it needs Windows 95 (mind you it ran fine on Windows 98). So please be aware that the computer company needs to make an updated version that supports Windows XP. 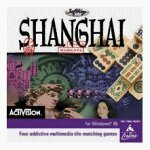 If you are not a fan of violent video games and need some relaxation with your PC, Shangai is great for you. But, if you have a later version of Windows 95, you'll need a patch. I have been searching for this game since I gave mine away after finding that my new computer would not accept it. I now have a laptop that has the setting it needs. I am so happy to have it back. I enjoy the Beijing game the best. I have not seen anything like it since. We have had this game for many years. Our favorite part is the tournament mode my Mom plays a tournament each day and we always look forward to the times we get to play the two player tournament. I have never found any other game that comes close to the fun we have playing this game. My only wish is they come out with an newer version that adds in new one and two player games. This one is two thumbs up!!!!!!!! I hope you enjoy it as much as my family does.